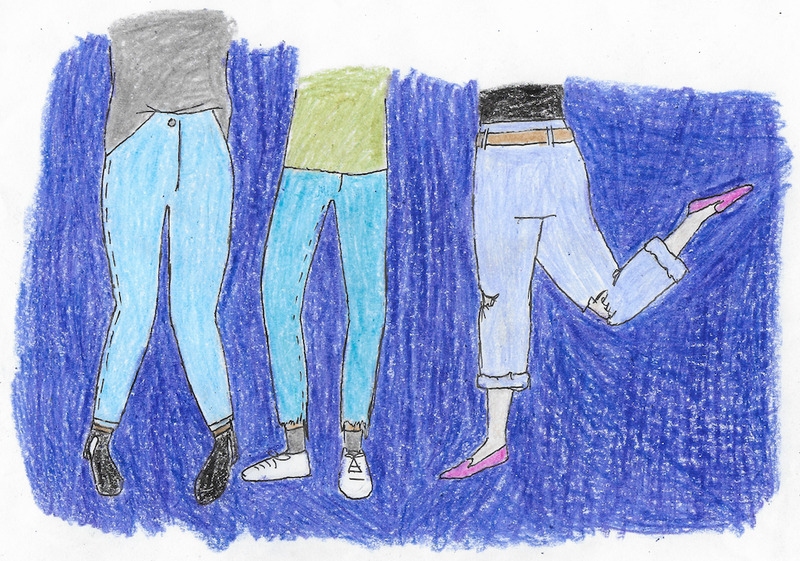 As a body-conscious woman, there is one fashion statement that I struggle to get behind: light-wash jeans. Some might wonder why it’s such a big deal — it’s just a pair of jeans, right? But for those out there who struggle with their body image, light-wash jeans tend to point out the things you usually hide under your regular layers of black clothing and yoga pants. Slipping into a pair of light-wash skinnies can not only feel suffocating, but seem to look suffocating too (or at least you can think they do). It can feel like your lumps and bumps are on show for the world — so why would you buy them in the first place, let alone leave the house in them? On the other hand, after years of trying to evade the truth, I’ve come to the conclusion that sometimes black jeans just don’t cut it. I know, I can’t believe I said that either. In a city that seems to live in the monochromatic and thrive on a combination of black and grey clothing, it’s hard to say for sure if baby blue truly fits the Vancouver colour scheme. So how do you incorporate light-wash into your fall and winter wardrobe then? I’m no expert, but this is how I’m coming to terms with a wider selection of denim. This might sound incredibly obvious, but skinny jeans aren’t the only shape option available. This summer, I wandered into the black hole that is Aritzia during their summer sale and gambled on a pair of light-wash boyfriend jeans. After a few days of breaking them in and getting their stretch going, it turns out that they are actually comfortable and make me feel like a super-casual human. Throw on some sneakers, a cozy sweater and a big comfy scarf, and you are fall ready. These are perfect for those breezy fall days where a jacket isn’t necessary. A major barrier with light-wash jeans is that they feel summer-y. Work to make them feel otherwise by layering things overtop of them. Get out a hoodie, that new Lululemon puffer vest you’ve been dying to try out and a winter beanie — perhaps all in your favourite fall and winter colours (for me that’s black, maroon and olive.) It will help give the illusion of more weather-friendly fashion, but still give you that pop of brightness. A leather jacket also gives off a cool look, if that’s your vibe. Another thing that I struggle with about light-wash jeans is that they can feel very informal. There is something clean and precise about wearing black or dark denim compared to a brighter hue. That said, there are options out there that might counteract this. Light-wash jeans that are embellished can be one way to make them more of a statement. I personally love the ones that have pearls on them! I can convince myself I look fabulous in anything that’s got a classy amount of bling, so maybe you can too. As a gal who is constantly trying to hide her tummy, there is something oddly comforting about a good pair of high-waisted skinny jeans. No, I’m not suggesting that you buy high-waisted light-wash and pair them with a midriff-baring crop top — you totally can if that’s your vibe, but there are other options too. Tuck your shirt into the front of them and slip on your favourite jacket so that from the side, your lumps and bumps are slightly more discrete, but you also give off that long-legged look. I have a long sleeve turtleneck that I love Queer Eye-French-tucking into my high-waisted skinnies and pairing with my streamlined grey wool coat to make me feel sleek and stylish. That said, they also make me feel like my not-so-toned parts are safe and secure from make an unwanted appearance throughout the day.